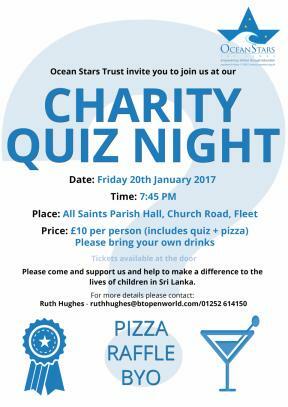 Tickets are £10 per person which includes the quiz and pizza. Please bring your own drinks. 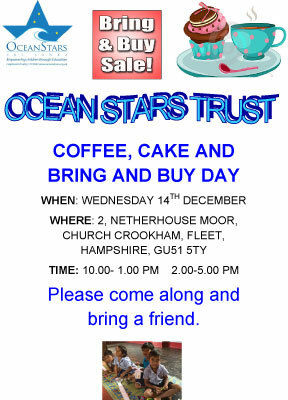 Please come and support us and help to make a difference to the lives of children in Sri Lanka. JAYDD Limited (Private LTD Company Number 10346019) was formed in September 2016 and is the trading company for Ocean Stars Trust. 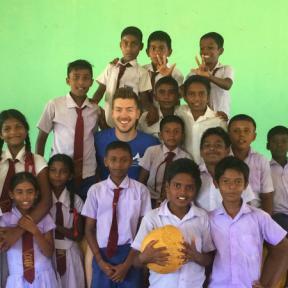 Jaydd organises Volunteering Trips and Holidays to Sri Lanka, as well as fundraising events for Ocean Stars Trust (Reg Charity 1110022). 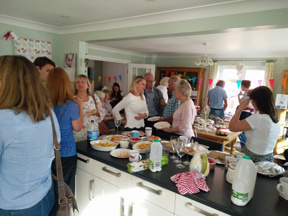 JAYDD also offers individuals, schools and other groups in the UK an opportunity to travel to Sri Lanka, and combines a sightseeing holiday with visiting a link school and/or volunteering in Sri Lanka. and e-mail us at: jayddlimited@gmail.com to plan your dream holiday experience in Sri Lanka. Let JAYDD take you to Sri Lanka. It’s been almost two weeks now since we returned from our 2016 team trip to Sri Lanka. As on previous occasions, it is taking me time to settle back at home. My head is still full of the sights and sounds we encountered during our time there. It was great to be back, to meet again with our Ocean Stars Lanka team who work tirelessly for us. We ask a lot of them and more than ever I am convinced of their commitment to OST and our dependence upon them as we seek to support and develop our work amongst the Batticaloa community. As I travelled around the schools, I met up with many of the teachers who have become my friends. I taught in the classrooms and delight-ed in the smiles and laughter that I shared with the children. I was humbled by the sheer joy evident on a local man's face when he re-ceived his chickens, a gift bought from our gift catalogue. And like the rest of our team I was quite stunned to witness computer classes, sewing classes, English classes all taking place in Hope House, Ama-planthurai, a remote and very poor part of the Batticaloa district. The work of Ocean Stars continues to progress, affecting and changing the lives of many living in remote and difficult circumstances in the North and East of Sri Lanka. We are very aware that this would not be possible without your support and on behalf of all the trustees, I thank you. Your gifts really are making a difference and changing lives. Download the full December newsletter and see the 2016 highlights. 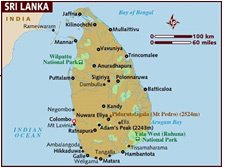 Meet the OST teams visiting Sri Lanka this Autumn. Also please like Beyond Boundaries fb page as we will have daily photo updates. We kindly invite everyone to add/like the page to get all updates daily as it happen, when it happen. 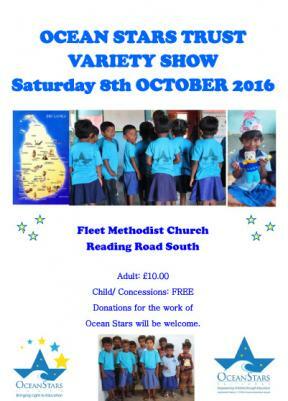 The 9th Ocean Stars Variety show was held on Saturday 8th October at Fleet Methodist Church at 6.00 pm. 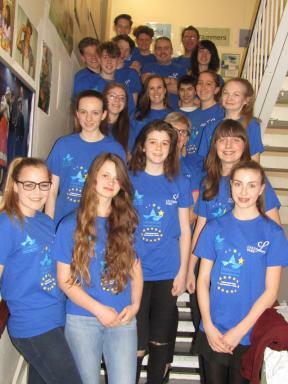 There were 21 acts that provided an amazing evening of talent and entertainment. 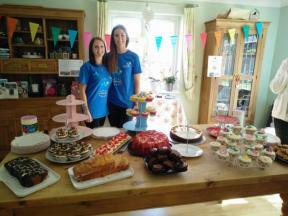 Over £650 was raised for the work of Ocean Stars. A BIG BIG thank you to all the performers, helpers and audience for making this annual event such a success. Here is the programme for you to enjoy! 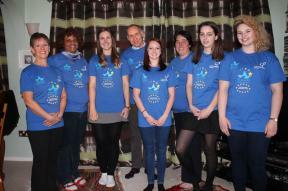 Before I left for Sri Lanka, I'd arranged to do some volunteer work for Ocean Stars Trust (OST). OST are a children's charity, founded in 2005 to support underprivileged children, families and communities in Sri Lanka following the 2004 Boxing Day tsunami. I left Trinco and arrived in Batticaloa (Batti; where OST are based) following a rare comfortable bus journey. Diana and Kiru welcomed me with beaming smiles before taking me to my guesthouse, which was nestled among the windy, dusty backroads of Kallady. We talked through the plan for the next four days. I was to visit three 'projects' (a secondary school and two preschools) where I'd assist in lessons. My first two days with OST were eye opening, sad, fun, interesting and intriguing. To have 10 year olds speak so frankly about their home hardships was initially hard to take. However, seeing their pearly whites shine as I we played games and I told them about home reminded me the kids were in good hands at school. It was a chance for the children to learn, have fun, be kids. Amazingly, many of the children's parents still need convincing that school is worthwhile. As well as the standard curriculum, in which the children are taught nine subjects, I'm convinced a tie with a foreign school – thanks to OST – can only help in educating the parents, for their children benefit from visits from people like myself. 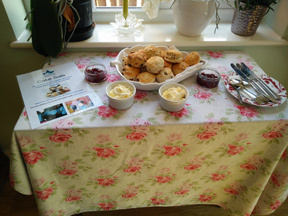 On Sunday 25th September Amy and Sophie held an Ocean Stars Trust afternoon tea at Amy's parent's house to raise money for the October trip to Sri Lanka. 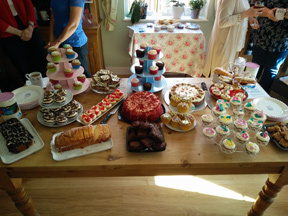 There were a delicious and huge range of cakes, sandwiches, tea and coffee, baked by friends and family. It was a great opportunity to talk about the amazing work Ocean Stars does and to share what we will be doing during the trip with everyone that attended and so kindly donated money to the charity! 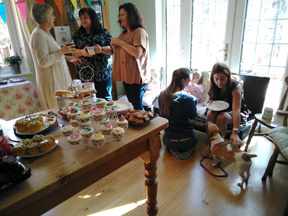 An amazing £330 was raised! 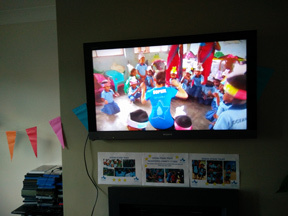 We also had a slide show of all the photos Sophie took last year so everyone could see what ocean stars does. 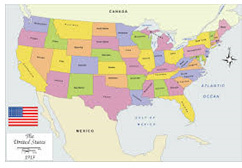 At which you will make three cards, have fun and raise money for a worthwhile cause. 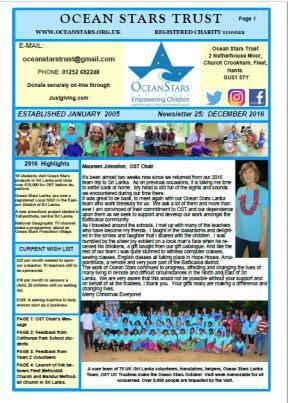 Ocean Stars ("OST") was an organization that I had only fleeting contact with before my first trip to Sri Lanka in August 2016. Despite this, Dilanee and the OST Team went out of their way to organize a trip to visit some of their projects while I was there. I visited the Mahadeva Children's Home in Killinochi, nurseries in the Batticaloa area (Amaplanthurai, Nallur & Karaveddy), and the Hope House in Amaplanthurai. On the whole, I was thoroughly impressed with the difference OST was making in people's lives in areas that have been devastated by war and natural disaster. What really stuck with me was the fact that OST was going beyond the "life-support" aid that many of us tend to associate with NGOs operating in these sorts of environments. The work OST was doing was, in fact, empowering people--particularly women and children--to be able to help themselves and their communities. I was born in the United States to Sri Lankan Tamil parents, and I have always been keenly aware of the suffering that people in Sri Lanka have endured after years of war and natural disaster. OST is doing remarkable work--in a compassionate and well-appreciated manner--to help turn the page for many of these communities, and I look forward to supporting OST as it continues to assist people in Sri Lanka.